The tile scheme in this bathroom creates a cohesive style that sets the tone in this relaxing, naturally-inspired space. While there is no real right or wrong when it comes to installing tile in your bathroom, certain tile varieties may be better suited to your situation or the manner in which you want to use the tile. It's the easiest place to begin the process of narrowing down to find the best tile for you by taking a look at the tile materials available and their relative merits. Ceramic: By far the most abundant tile material, and most popular, ceramic offers the largest selection of possibilities within any set of factors. Ceramic tiles can be made from a variety of clay types, each with it's own set of color and texture characteristics. It can be made into any shape or pattern, glazed or painted with any color, and can even be made to look like other materials. Porcelain: A stronger cousin to ceramic, porcelain is typically offered in a selection of neutral colors with subtle marbling or veining. If durability is a concern, porcelain is worth considering. Natural Stone: Any of the variety of natural stone out there, such as slate, sandstone or marble, can be cut into tiles for use in the bathroom. Most natural stones offer strength and resistance to humidity or heat, but not all stones are slip resistant, so it's important to weigh the pros and cons for any natural stone you may be considering. Most natural stones will require sealing and a higher level of maintenance in the long term. Glass: Most commonly used for wall treatments rather than on the floor, glass is an ideal choice for a low-maintenance, reflective material. 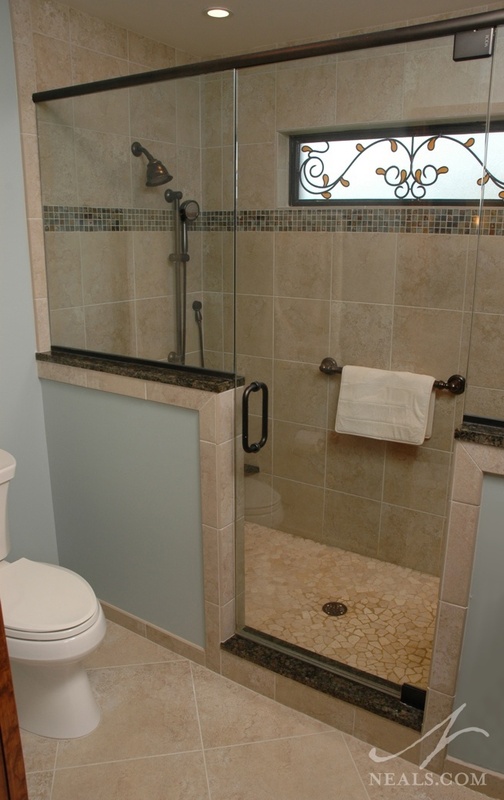 Glass tiles can often be utilized for additional color accents, or to assist with creating a specific design style. This curbless shower entrance shows off the luxurious style of wood-look tiles and large-format tile used on the wall, both trending in 2015. Wood-Look Tiles: Ceramic tiles made to look like wood are not new, but we've seen an increase in their use this year. Wood in the bathroom feels like a luxury, but comes with obvious issues. By choosing a wood-look clay tile instead, those issues can be side-stepped. The versatility of ceramics allows for the creation of wood-like tiles in any texture and color with varied effects. Graphic Patterns: We've talked about water jet tiles in the past, and the intricate patterns achievable in modern tile design. We're seeing a rise of interest in large-scale mosaics that rely on pattern repeats well beyond the confines of a square grid. Many of these types of designs are influenced by Moroccan or Middle Eastern motifs. Large Format Tiles: Long gone are the days of the 4x4 tile's dominance in the bathroom. In recent years, homeowner's have begun taking advantage of tile manufacturers' ability to produce larger tiles without sacrificing overall tile durability and strength. We've even started seeing a desire to install these over-sized tiles on more than just the floor. The result is a modern look that feels right for the design style of the 21st century. By sticking with a cream and brown palette, the various tiles in use in this bathroom compliment each other, but add visual interest. Play with size: In addition to mixing different materials in the tile work, consider the way the tile sizes relate to each other. This isn't to necessarily suggest that large tiles should be paired with small accents, but that's one, easy option. Pick within a limited palette: Select 2-4 colors and mix and match tiles within those, looking for subtle variations or different textures. You can extend that even further by ignoring any neutral colored tiles, such as what you might use for the floor or the field tiles in the shower. Don't overdo it: Make sure your eyes have places to rest by balancing busy or bright titles with soothing solids. 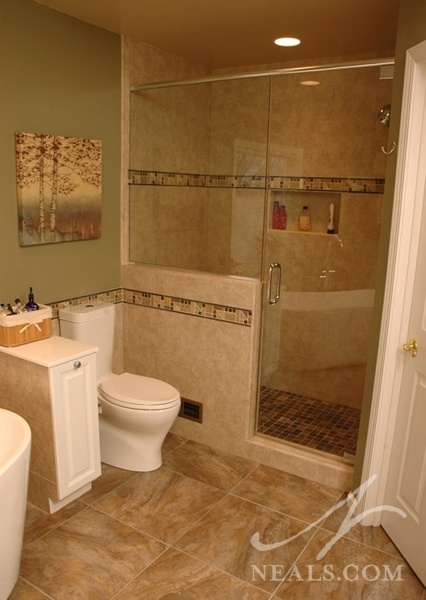 For example, if you've selected a glossy, highly-reflective tile, mix it with a matte tile to avoid overload. 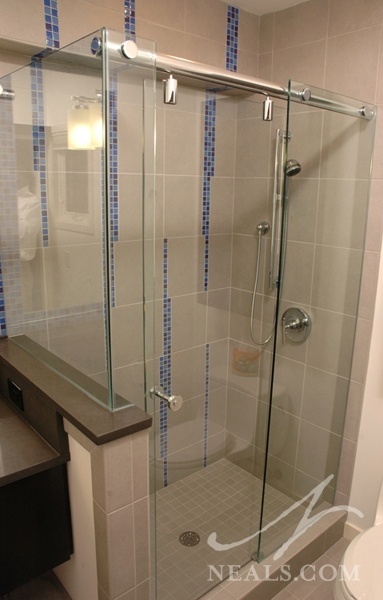 Playful blue glass mosaic tile creates a design feature in the otherwise neutral shower. We're undoubtedly biased on this, but a design professional and an experienced installer are great resources for upgrading your bathroom's tile. Your designer can assist you with all of the considerations above, and help you narrow down the range of options. 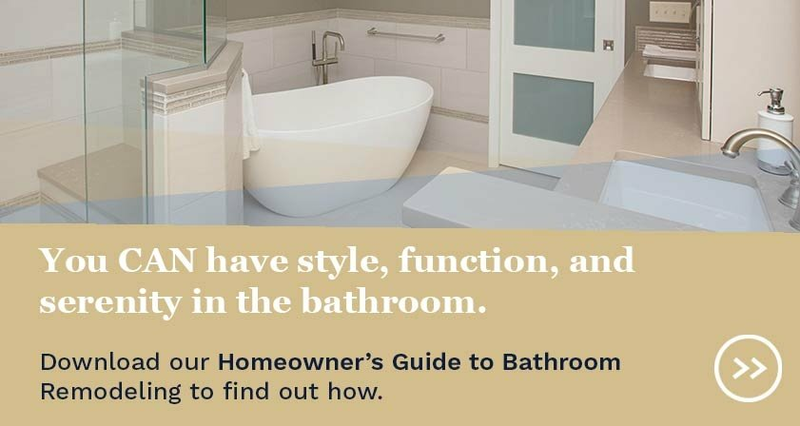 They also have access to a much larger variety of tile types and styles than big box home improvement stores, which is a considerable asset for finding that "just right" shape, color, or texture. A professional installation will ensure that all the effort to find the tiles that are perfect for your bathroom look the way you imagined. 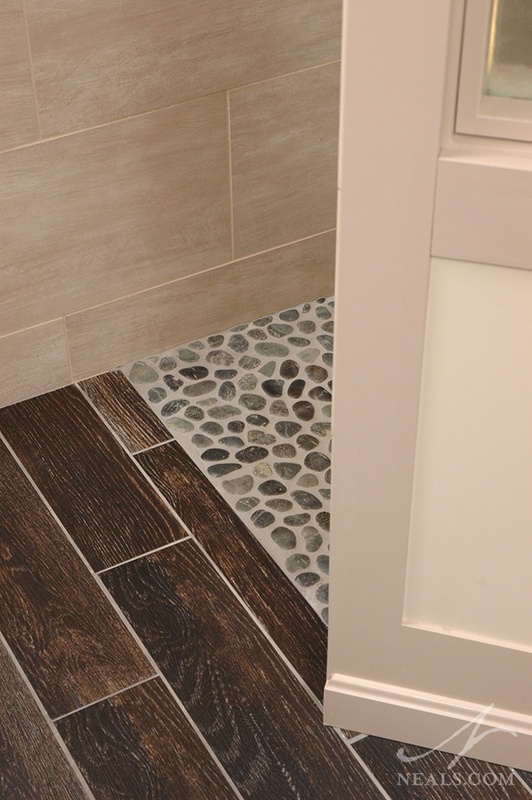 For more bathroom tile ideas follow us on Pinterest and Houzz.